Guys, I'm seriously drooling over my nails right now. I love how these skittles turned out! And yes... I actually did manage to water spot my nails and live to write about it! To start out this mani, I painted two coats of Leggy Legend onto my left ring finger, my right thumb, and my right ring finger. All of the other nails got 4 coats of KBShimmer Owl Miss You. For my water spotted nails, (left middle, left thumb, and right middle) I applied a coat of Seche Vite over Owl Miss You and let it dry. I added drops of Leggy Legend into a bowl of lukewarm water, just as I would've done for a water marble. When I had enough color, I sprayed the surface with aerosol hairspray until I got the size spots I wanted. My spots were a little sparse on two nails, so I went back and water spotted each one again. Remember those nails I painted with Leggy Legend? 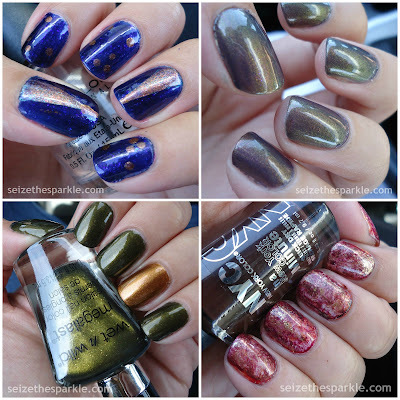 They all received a coat of Orly Gossip Girl, followed by alternating coats of Pahlish Autumn People and Gumdrop Rooftop. I just kept going back overtop until the flaky sparkle was really noticeable. My gradient nails came next. After the water spotting and glitter accents turned out so well, I figured I needed a little more sparkle on the other nails too. Using a sponge, I alternated between Autumn People and Gumdrop Rooftop again. They turned out really well, a nice balance between the other two designs. 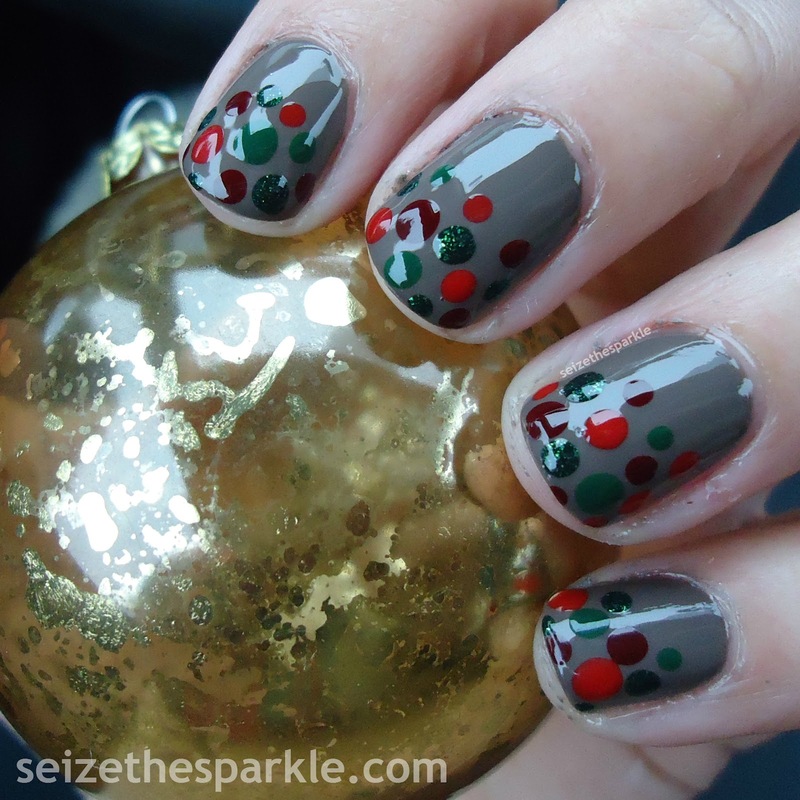 While I was painting, I had an idea that this was probably going to be my Christmas manicure. So, I made sure to add some extra clear coat and Seche Vite to really lock everything in. I'm really happy with how these turned out! As another year comes to a close, I've found myself reminiscing, reviewing, and recapping. It's hard for me to imagine just how many new nail polishes that hit the market in any given year. Thousands? Hundreds of Thousands? I'd love to know the actual number! Nail polish trends change so quickly from season to season, and they also vary between brands. For every traditional collection out there, you can almost always expect a random collection with colors that we all love, but aren't really seasonal. In addition to experimenting with colors, there's also experimenting with different finishes. From bar glitter and contrasting shimmer to textured and holographic glitter, we've seen a lot of variation in 2015! Out of all those polishes, only a select few really get the nail world buzzing. And so much can happen over the course of 12 months! Gel polishes really became a thing, two popular brands went out of business, and a PR nightmare resulted in a huge campaign to support independent nail polish brands. And those are just the highlights! Metallic finishes were everywhere this Fall. 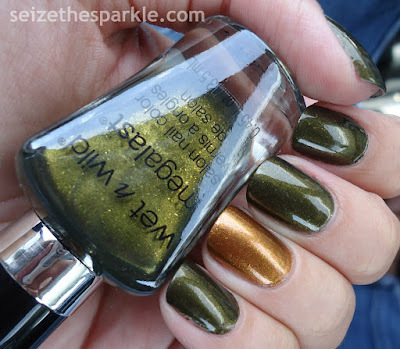 Every single polish in Wet n Wild's Fall Collection Here's To The Wild One featured a metallic finish. I Moss Have It was the green of the collection. A deep, brooding, metallic olive green shade that I definitely had to have! I know, I know... it's a technique, not a nail polish! But I really latched on to Seriotypes earlier this year, and I can't get enough of it. I love that it doesn't require a whole lot of artistic ability, because me and drawing just don't go. But this? It's like a collage on my nails, and it's so much fun to play with different colors and finishes! Definitely stay tuned for more in 2016! Not to quote NPR or anything, but all things considered, it's been quite a year! 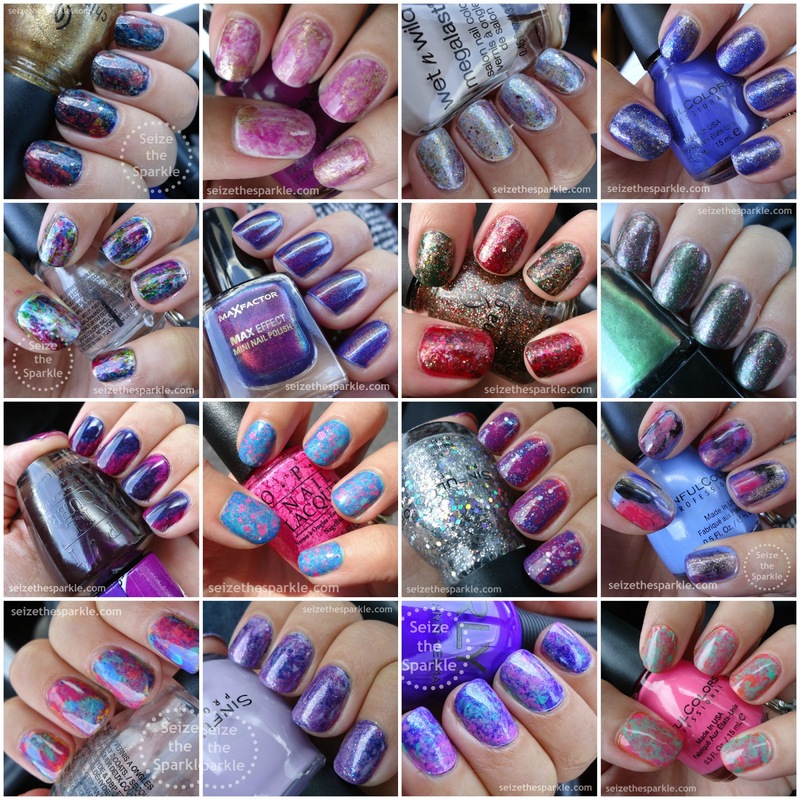 If I had to nail down (haha) any particular trends, I'd say that shimmer and multichrome flakies really took the cake for 2015. Definitely makes me wonder what the next big thing will be for 2016! What were some of your favorites from 2015? What do you want to see in 2016? Let me know in the comments! 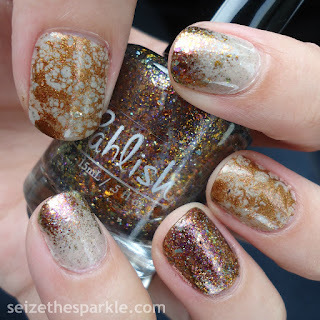 When I first saw Autumn People by Pahlish, it was love at first sight. 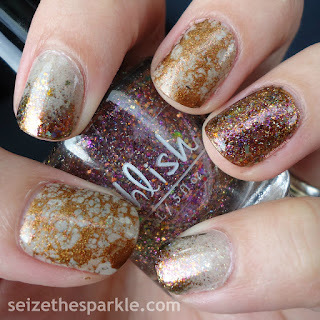 So, when Pahlish announced their December Monthly Duo Confectioner's Castle would feature a multichrome topper... I knew I had to have it. It was the only nail polish related purchase I made during Black Friday weekend. 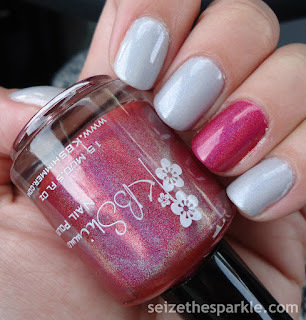 This is the second time I've order from Pahlish, but the first time that I've taken part in a Pre-Order. To say that I was anxiously awaiting the arrival of the Confectioner's Castle Duo is probably the understatement of the year. With Holiday shipping in full swing, the tracking didn't update past Friday until yesterday morning, so I was checking the mailbox all weekend long. Then yesterday, it was there! A lovely purple mailer with these two beautiful polishes inside! Gingerbread Baker is described by Pahlish as a "medium wine cream" polish, and I'd say that's accurate. It leans a little more blue than I expected, but I'm loving wine and berry colored everything right now. Application was good... most people could probably use two coats and be done. Three is my fail safe, so that's what I used. Gumdrop Rooftop is described as a "clear topcoat with a mix of iridescent glitters, ultrachrome flakes, and scattered holographic flakes." It's a warmer version of Autumn People. 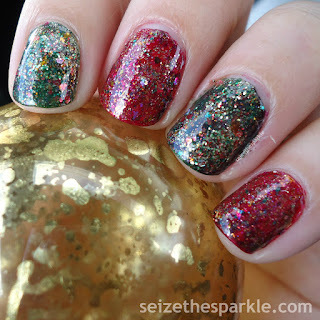 The flakies in that flash gold to green, while Gumdrop Rooftop is warmer, flashing gold to orange to red to fuchsia. 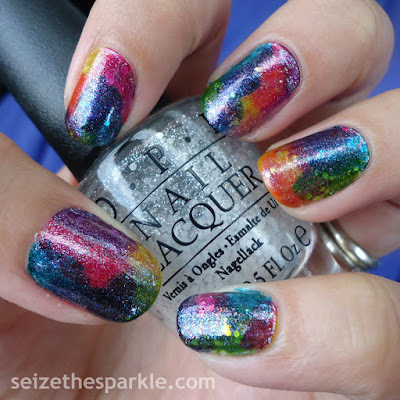 There's square iridescent glitter in there, along with small iridescent flakes that flash through the rainbow. Overall, there's a warmer feel to Gumdrop Rooftop. It's a perfect match to Gingerbread Baker just like how Autumn People is a cooler, perfect match for the green of Stopped Watch. And it is Stopped Watch. I realized over the weekend that I had been calling it by the wrong name and did my best to fix all of my mentions of it. When I painted this on last night, I had all intentions of keeping this layering on for another day or two, but I'm not sure if I'm going to do that or not. 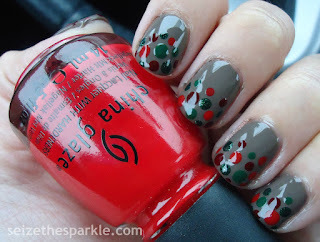 There's still one more Manicure of Christmas left to go, and then I've got a couple more Holiday mani ideas brewing! 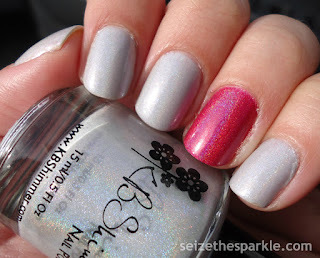 I'm really wondering what Gumdrop Rooftop will look like over other polishes, like a lighter shimmer, or a duochrome. But then there's also presents to wrap, and a bath bomb that's calling my name. I guess we'll just have to see how the night goes! Wet n Wild Color Icon Collections usually make me stop in my tracks. Aaaand then proceed to buy every polish on the display. This year, I showed tremendous restraint and only purchased two. But I've been eyeballing what's left every time I walk by the display. Los Feliz Navidad has a huge sparkle factor, and that's what initially drew me in. But then I noticed the gorgeous slightly purple blue color and gold sparkles. It looked familiar, but I bought it anyway because I was curious about the formula. I'm definitely glad I picked this one up, because it is a gorgeous glitterbomb of a shade, perfect for this time of the year! It's an unwritten rule here at Seize the Sparkle... Just because a polish is a glitterbomb does NOT mean that you can't add more glitter to the mix. Glitter is always encouraged. ALWAYS. Los Feliz Navidad turned out to be a textured glitter polish, just like I thought it might be. I can't say that it's an exact dupe for L'Oreal Too Dimensional, but it's close. I feel like this shade is a little bit lighter and a little more sheer. 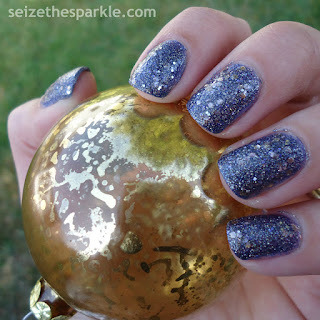 It's a gorgeous blue-violet polish packed with textured glitter in the same color, small gold hex glitter, and a wash of shimmer that flashes green to gold. Who wouldn't put more glitter on top of that? 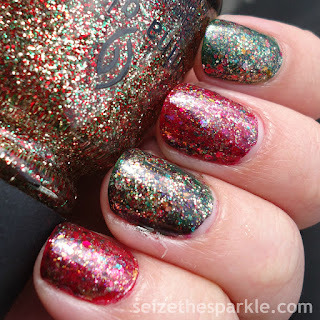 Orly Gossip Girl is a glitter topper from the Infamous Collection. It's a mix of small red hex glitter and large gold hex glitter. 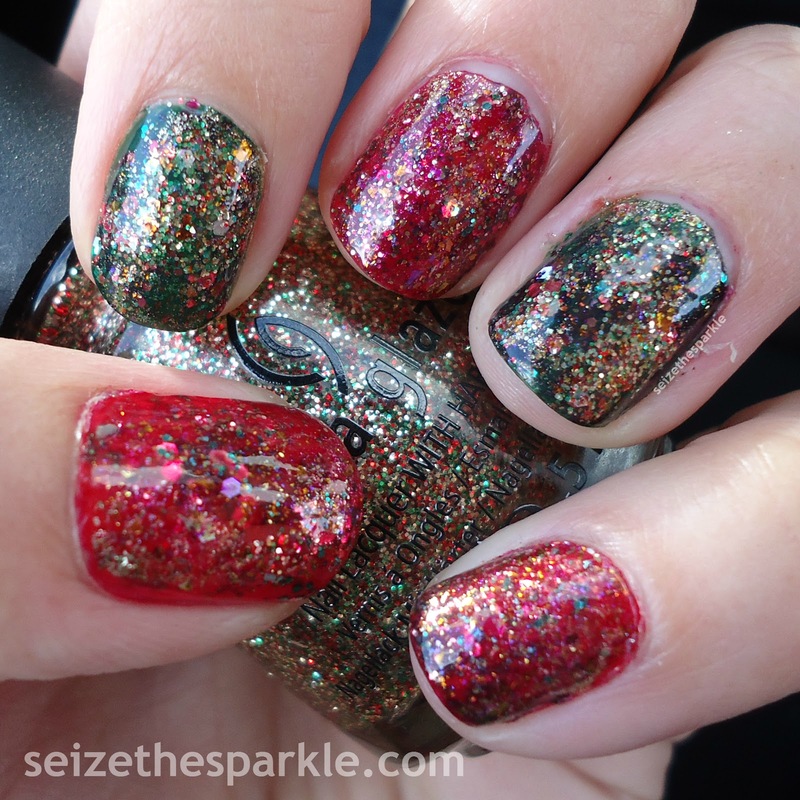 Glitter payoff is ah-mazing, actually more than what I was looking for in this particular layering. Did that stop me? Nope. I just went over everything with another coat of Los Feliz Navidad, turning the red and gold glitter in Gossip Girl to a nice shade of violet and greenish gold. It was the perfect compliment to what was already going on in Los Feliz Navidad. Because I'm not the biggest fan of a gritty finish on my nails, I added two coats of clear and a coat of Seche Vite in an attempt to smooth things out. 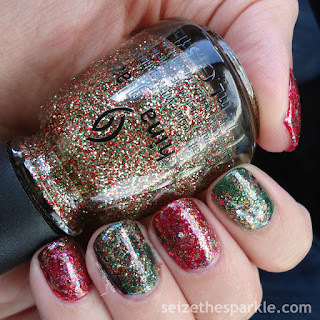 This layering was far from smooth, but I love how a little top coat really brings out the sparkle in polishes like Los Feliz Navidad! I really love how this layering turned out. 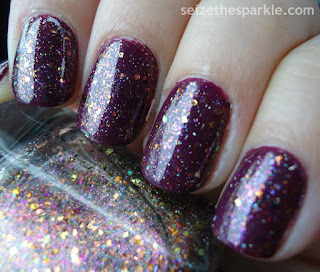 Even without the addition of Gossip Girl, Los Feliz Navidad is like a galaxy manicure in a bottle. 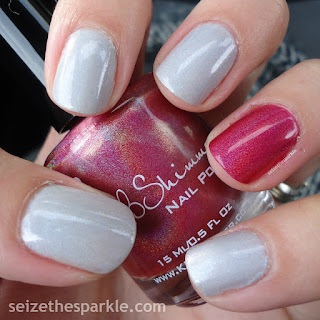 I'd love to see more polishes like it in some color combinations we haven't seen yet! In retrospect, 2015 has been quite a year. Lots of growth and changes, both personally and on the Blog! Growth is something that I actively strive for, and in April of this year, I finally joined a Facebook group for nail bloggers, Hobby Polish Bloggers. It's a great group of women who genuinely support each other and I'm really proud to be a member. Now, I know that candy canes are white and not holographic, shimmery silver, but I just couldn't resist pairing these two up! Plus, I normally use a metallic or texture polish as an accent, so it was fun to switch it up a little. Out of all the items on my polish wishlist, Fleece Navidad was by far the most coveted. I knew it was gorgeous in other photos I had seen, but when I saw it in person? Swoon! First of all, there's the really soft shade of gray that forms the base coat. Then there's the subtle holographic shimmer. 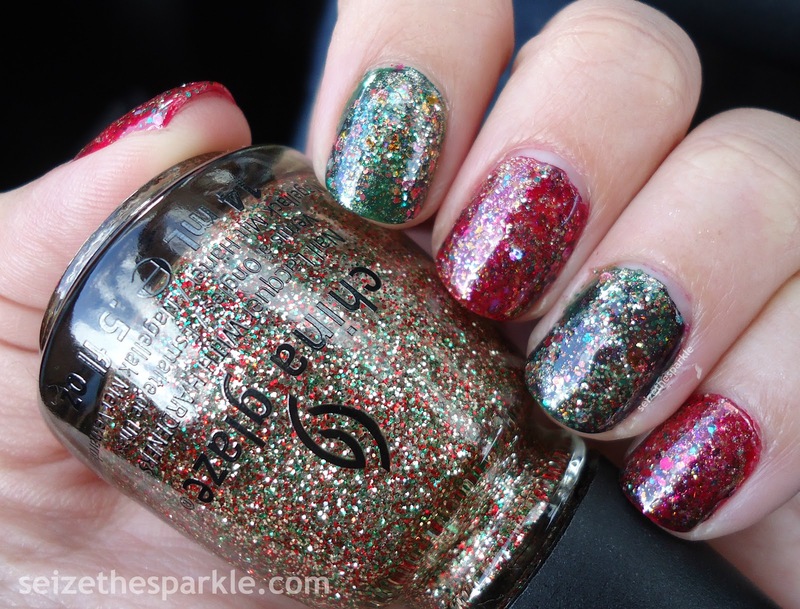 But on top of that, Fleece Navidad also has what KBShimmer calls "blue microflakes." I see not just blue, but green to blue and blue to purple microflake shimmer. The formula on Fleece Navidad is great, really easy to work with. Because of the shade and finish, it is a bit sheer. But it builds nicely, and I really love how it looks on my nails. Like I said, I wore it all weekend and really loved it. If you need a pallet cleanser, which I definitely did at the time, Fleece Navidad is an excellent choice! On to Whole Lava Lovin'! I've been dipping my toes into the world of holographic polish, and this pinkish-red stood out because it was so incredibly pigmented. And the fact that it's one of my favorite shades of berry pink/red doesn't really hurt either. Whole Lava Lovin' has a more noticeable holographic shimmer than Fleece Navidad. In the shade, it reads as a warm red/gold shimmer that makes this polish just glow. Whole Lava Lovin' is insanely pigmented, so I'm sure most people could get away with 2 coats and be done. I probably could've been done at two or three, but I decided to match Fleece Navidad coat for coat, shimmer for shimmer. I really love this manicure, and I'm a little sad that I'll be taking it off tonight to paint something else. But the show must go on, and there are still more manicures to be painted! In my head, I pictured this as more of a gradient dot manicure. It didn't exactly turn out that way. I also thought that Nirvana would be a great base for my Christmas dots. Looking at my photos, it's a little dark and cool. While Nirvana is a bit warmer in person, I wish I would've chosen a lighter polish for this nail art. I think that would've made all the difference. Now, I know what you're thinking. Four coats of Nirvana? Yes. But three would probably do for most people. My first coat was a little splotchy, and by the third coat, I thought I could still see a few patches. So, I added a fourth coat just to be sure. 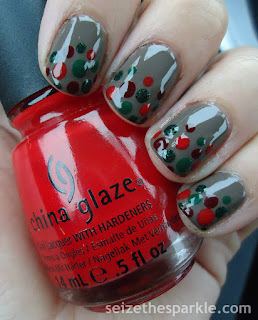 Using a dotting tool, I randomly placed dots of Glittering Garland, Holly-Day, Pointsettia, and Ravishing Dahling on each nail. I regret not varying the size of the dots a little bit more. Also, I think I wanted more of a gradient than the half dot tips that I ended up with. In person, I really like this manicure. The dots are such a fun way to add a little bit of Holiday cheer to your nails without going overboard. Originally, I thought of using A Latte Love from Wet n Wild, but wanted to go darker. I considered Essie Chinchilly and SinfulShine Prosecco for a little while too, but deemed them to be too light. Nirvana was definitely turned out to be too dark of a choice. Looking back, I think a warm shade right between Chinchilly and Nirvana would've been preferable. Cultivating the right pallet for a manicure can be challenging... especially when you're working with what you've got in your stash rather than buying new. But any nail blogger will tell you, you live, you learn, and you try again another day! So, in addition to the lack of snow, there was a lack of sunshine on the day I painted and photographed these nails. It was a gray, rainy, stay-inside-under-the-covers kind of day. I would love to say that's the reason why Essie Haute Tub appears to look black, rather than the lovely navy blue with purple to gold shimmer that you see in the bottle. Sadly, this is just one of those shimmers that doesn't translate as brilliantly onto the nail. And without ample sunshine? Nope. As a backdrop for stark, white snowflakes, however? It's totally perfect. I really like the contract. I mean, yes, more sparkle is always better. 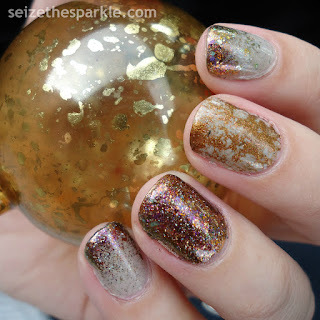 It's always disappointing when contrasting shimmer doesn't show up on the nails like it does in the bottle. 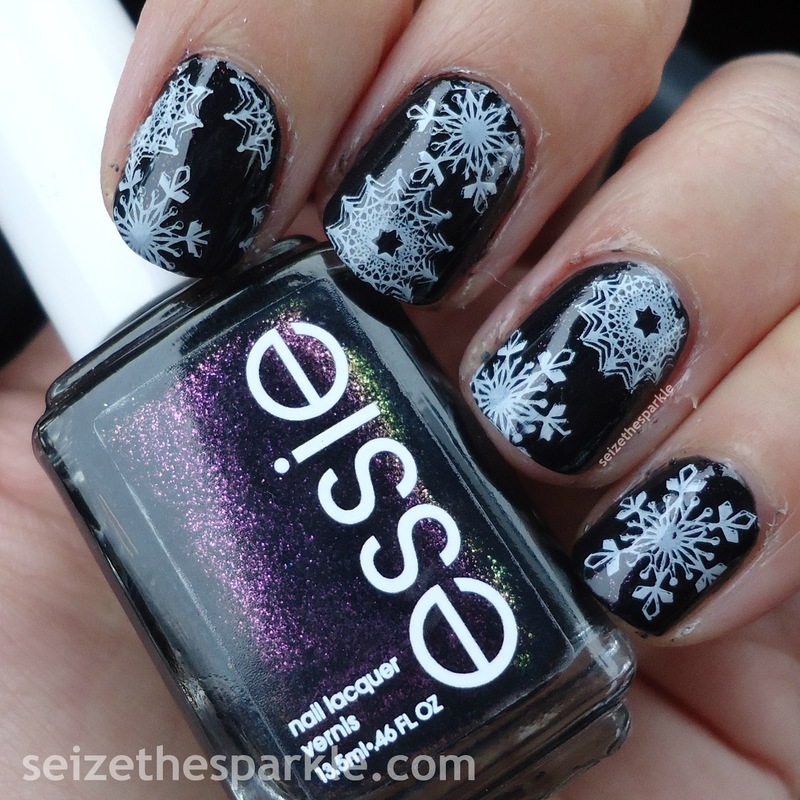 But with these stamped snowflakes, I don't really mind as much. In other news... Essie recently announced their newest collection Retro Revival and sent a buzz throughout the nail polish community. 2016 marks Essie's 35th anniversary, and they're celebrating by bringing back six retired favorites in the Retro Revival Collection. Due in stores January 2016, the collection is comprised of Bikini with a Martini, Birthday Suit, Cabana Boy, Life of the Party, Sequin Sash, and Starry, Starry, Night. Yep. That previously extremely hard-to-find without shelling out hundreds of dollars Starry, Starry, Night. So, no. 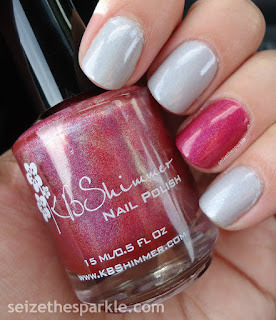 I really don't mind that the shimmer is a little lacking in Haute Tub. Because I'm about to be able to squash a very huge lemming that I never thought I'd be able to even afford. And it's not like the collection is priced a little bit higher than normal. 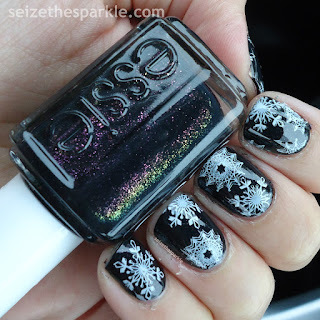 Essie totally could've charge $20 per bottle and we'd all pay that. Nope. 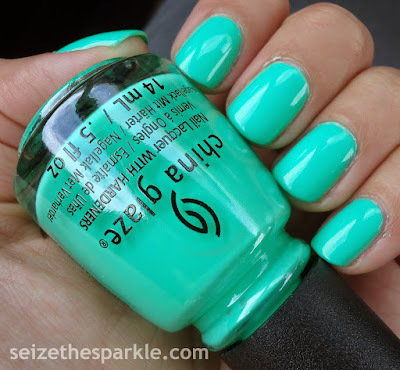 This collection will be in stores, and will sell for $8.50/bottle, just like any other Essie polish. I haven't decided yet if I'm going to order it online, or try and track it down in stores. Maybe order one, track down a backup? I do really love a good brick-and-mortar nail polish hunt! But back to Snowflakes in the Haute Tub... I thought about adding a little more shimmer before stamping. The glitter side of my brain wishes I would've added a coat Pure Ice Busted or Iris. But then that other side really likes the minimalist, stark quality of this stamping. And then there's that voice in the back of my head that wants me to get a few more snowflake plates so I can do a snowflake version of a pond manicure. And wouldn't Starry, Starry, Night just be the most gorgeous and appropriate background for that? Definitely on my to-do list!